Our sweet little dog Roxy is having puppies. 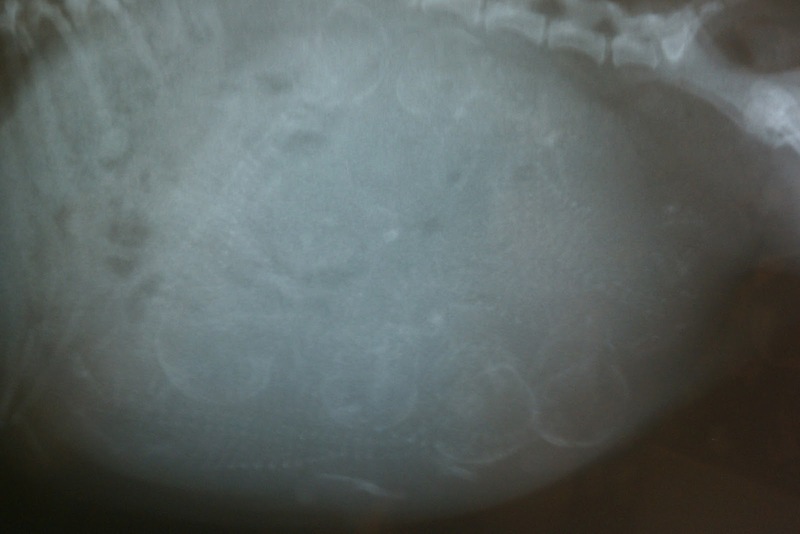 Here is the x-ray taken today so we would know how many puppies to expect. I knew 2 for sure, thought probably 3. So can you tell how many there are in there? I numbered their heads, there are 6 puppies!!!! How cool to see an X-ray like this! Holy Hannah!!!! 6 puppies!!! I so wish I could be there!!!! I taught Katie to say to Ken, "puppies please." lol Ken doesn't think it is to funny! MINI ROXIES!!! Oh my goodness :) so what are you going to do with the puppies? I guess congratulations are in order? 6 puppies! You are going to be a busier Mom than ever! Hope you are feeling better these days. When is the big day? We are still in disbelief that she is having 6. Daylyn wants to be a vet so this should be a great experience for her. I am feeling better, and am using my arm a tiny bit, I can move my wrist completely, and my arm can hang down completely straight which is a huge improvement! LOL. We think the puppies are due in about a week and are starting to get excited!